A musical interval is a measurement of the difference in pitch between two notes. Another usage of the word refers to any two notes played together, as in two-note chords, but in this article we'll focus on the first meaning, the pitch difference (or relationship) between any two notes. A knowledge of musical intervals is considered necessary for those wanting to have a deeper understanding of chords and scales. In fact, a basic knowledge of musical intervals is useful for all musicians who play 'pitched' instruments. Musical intervals are important because it is the pitch difference between the notes that makes melodies and chords recogniseable as music (that and timing). It's not so much the actual notes of any tunes themselves as they can all be changed in pitch (raised or lowered equally) simply by starting the tune on a different note. The notes make the actual sounds, of course, but it’s the succession of musical intervals (pitch intervals and timing) that make the music. For example, we can sing any song and start it on any note we choose. 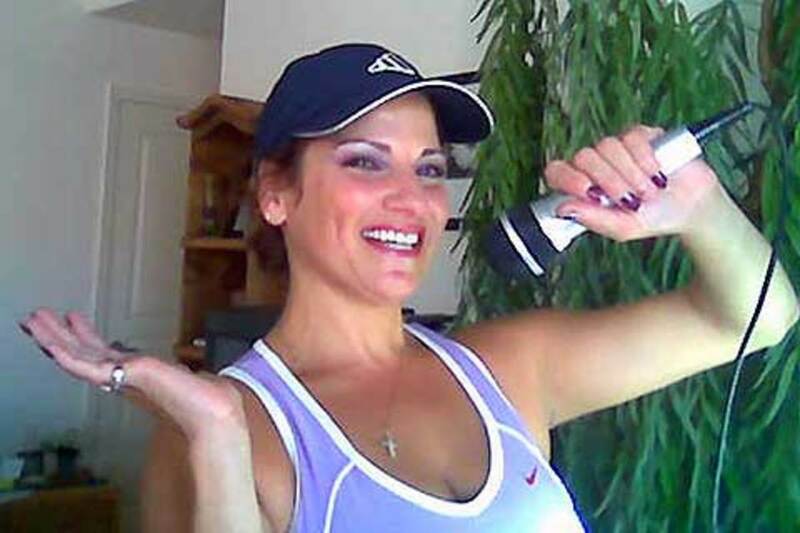 Wherever we start, it’s always the same tune–just higher or lower versions. All the notes are going to be different depending on which one we start on, but, importantly, the intervals don't change, no matter which note we choose to start on. 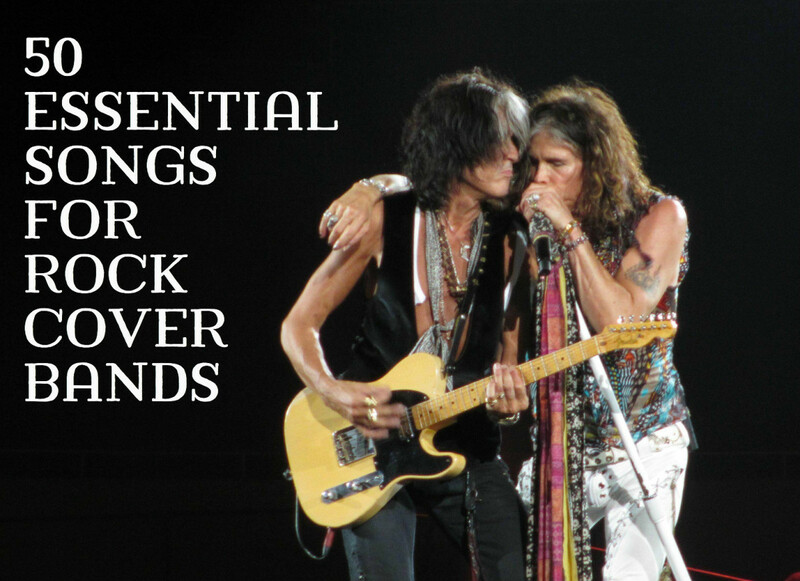 It applies to every melody, scale and chord. Intervals really are the building blocks of music. Look at the picture below showing two versions of the same tune. Even if you don't read music, you can easily see that the shape of the tune is the same in both cases. All the notes are different but the tune sounds exactly the same in both versions apart from one being lower in pitch than the other. The tune is the same in both versions because the various musical intervals between the notes in each version are exactly the same in both cases (different pitches, but the same intervals). There are two common ways of measuring the pitch difference between two notes. One way is by using small units called whole tones and semitones (also known as whole steps and half steps in the US). 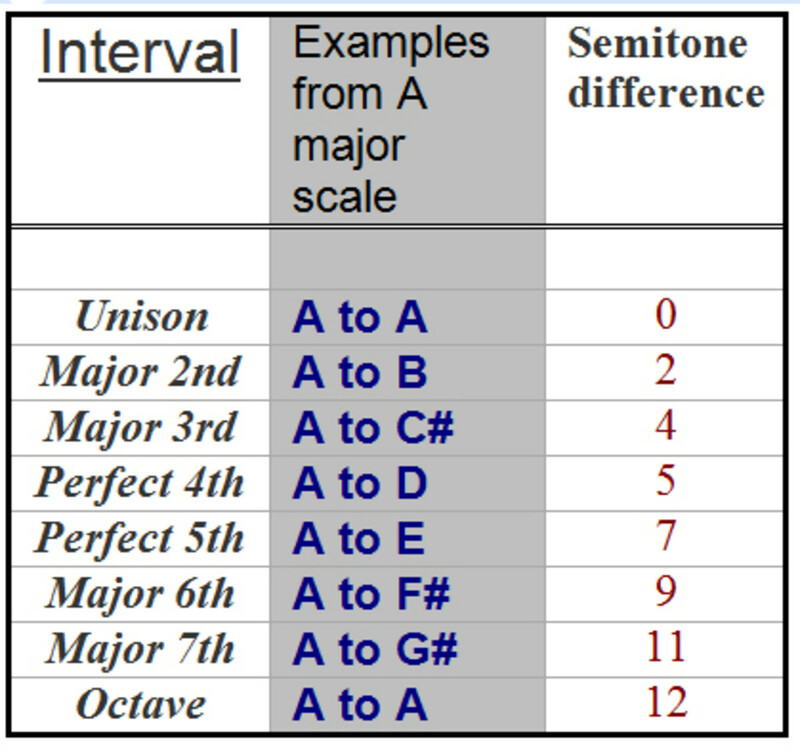 A semitone is the smallest pitch difference that we use in our standard Western major-minor system of music. It's the difference between any two adjacent notes of the musical alphabet shown below. (There are intervals smaller than semitones, called microtones, but they aren't part of our standard Western music system). More practically, It’s the difference in pitch between any piano key and its nearest neighbour (black or white) up or down, or the distance between any two adjacent frets under the same string of a guitar. For singers, it’s the distance from Ti up to Do in solfege, or, alternatively, the opening notes of the ominous Jaws movie theme. Two semitones (half steps) make a whole tone (whole step), and there are 12 semitones before we run out of note-names (including sharps/ flats) and come back to the same note-name, twelve semitones higher. The interval between the notes A and A# (or Bb) is a semitone. When both notes of an interval are named from the same letter (such as A and A#) it's called a chromatic semitone. If the same semitone is named based on notes with two different letters (such as A and Bb) it's called a diatonic semitone. That's a fairly academic point though. In the modern tuning system called equal temperament, diatonic semitones sound exactly the same as chromatic semitones, just as the note, A# now sounds exactly the same as Bb. (They weren't always the same). For most purposes it's just called a semitone or half step. The other method of labeling intervals gives the interval a number depending on how many letter names are involved in counting between the two notes. So, for example, if we want to know the interval between the note A and the nearest C above it, we start from the lowest and count the number of letters involved. A to C spans three letters (A, B & C), so that’s called a THIRD. The interval between D and the nearest G above spans four letters (D, E, F & G) so the interval from D to G is a FOURTH. C to the next C above involves 8 letters (CDEFGAB&C). That (and any other “eight letter span”) gets the special name of octave (from Latin 'octo' = 8). The next C above that would give an interval of two octaves. We can also have an interval name for C to the same C (such as two singers singing the same note). It's called a unison. We can also go further than an octave. For example, the interval between A & B is a second, (the interval spans two letters A & B). The interval from A to the next B above that spans 9 letters (ABCDEFGA & B). So we can call that large interval a ninth. Intervals greater (wider) than an octave are called COMPOUND INTERVALS, and those smaller than an octave are called SIMPLE INTERVALS. We can call that large interval from A to the higher B, a ninth or a compound second. We don't normally count intervals any larger than a thirteenth (which is also a compound sixth). Instead, we just think of them as compound 3rds, 4ths, etc. Compound intervals don't really feature in melodies as melodies usually never leap greater than an octave. In harmony, compound intervals are usually so similar in effect to their simple-interval counterparts that we can usually ignore the difference, and you can assume for the rest of the article that the information applies to compound intervals too. Using numbers isn’t quite enough, though. Consider the interval from A up to C# (we always count from the lower note to the higher). There are three letters involved, A, B & C, so it’s a third, but because the upper note is C# instead of C, it’s a little bigger than the third that we first encountered above (A to C). It's exactly one semitone larger, in fact. In order to distinguish between these two thirds of different size, the larger one (A-C#) gets called a major 3rd interval and the smaller one (A-C) a minor 3rd Interval. Major and minor are two of the terms that describe what’s known as the quality of intervals. So, intervals have a quality as well as a number that we use when we need to be more specific. Major, minor, perfect, augmented and diminished. SECONDS, THIRDS, SIXTHS and SEVENTHS. UNISONS, FOURTHS, FIFTHS, and OCTAVES. All major or perfect intervals can be AUGMENTED by expanding or reducing them by one chromatic semitone. Similarly, all minor or perfect intervals can be DIMINISHED by reducing them by one chromatic semitone. A - Bb is a minor second. A - B is a major second. A - C is a minor 3rd. A - C# is a major 3rd. A - F is a minor 6th. A - F# is a major 6th. A - G is a minor 7th. A - G# is a major 7th. So-called 'perfect' intervals are a special class of interval. Notes separated by perfect intervals have a very strong acoustic relationship with each other. A - A (same note) is a perfect unison. A - D is a perfect 4th. A - E is a perfect 5th. A - A (next A higher) is a perfect octave. Note that we usually drop the word perfect when talking or writing about perfect octaves and unisons. The 'perfect' part is assumed, unless we indicate otherwise. As mentioned, if we take any major or perfect interval and expand it by a semitone (but keep the same letters) the interval is said to be augmented. We can do that by raising the upper note or by lowering the lower note. As we saw above, the interval A to C# is a major 3rd. If we lower the bottom note, we get Ab to C#. There are still three letters covered by this interval (A B & C) but it's one semitone larger than the major 3rd - hence the name, augmented 3rd. Similarly, we can reduce the size of an interval a semitone by lowering the upper note or raising the lower note. Again, using an interval we saw previously, A to C is a minor 3rd. If we raise the lower note, we get A# to C. There are still three letters covered (A, B & C) but the interval is now one semitone smaller than a minor 3rd, hence the name, diminished 3rd. A to D is a perfect 4th, so A to D# is an augmented 4th and A to Db is a diminished 4th. A to G is a minor 7th, so A to Gb is a diminished 7th. Bb to D is a major 3rd, so Bb to D# is an augmented 3rd. Find the number of the interval by counting the letters covered by the interval. In this case, the interval covers six letters (A, B, C, D, E & F) so it's a 6th of some kind. Next, as the lower note of the interval is A, count up the A major scale until you come to the sixth note. In this case the note is F# and we know (from the chart showing the intervals of the major scale) that the 6th scale note (F#) is a major 6th above the key note (A). Our note, however, is F, which makes our interval one semitone smaller than a major 6th, so it must be a minor 6th. If you want to know how to make any major scale, see my article on Major Scales. Some intervals sound identical but are named differently depending on how the individual notes are named. For example, the interval, A to D# (augmented 4th) sounds the same as A to Eb (diminished 5th) since D# and Eb are two names for the same pitch. These intervals (like those notes) are said to be enharmonic equivalents of each other. Another name for this interval is a tritone as it equals three whole tones. Diminished 7th (A - Gb) is enharmonically equivalent to a major 6th (A - F#). 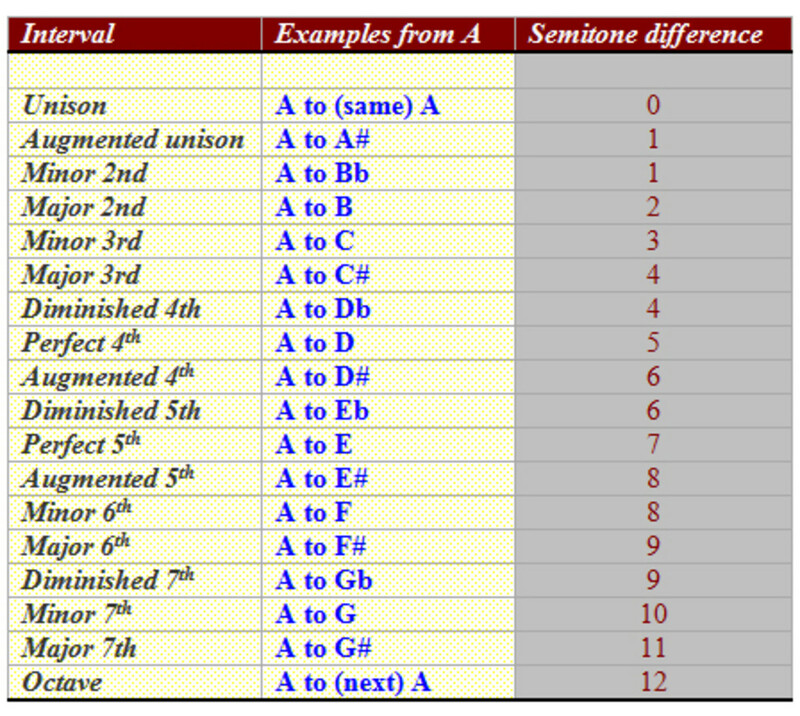 Augmented unison (A - A#) is enharmonically equivalent to a minor 2nd (A - Bb). Major 3rd (A - C#) is enharmonically equivalent to a diminished 4th (A - Db). If the two notes that form an interval are played one after the other, the interval is said to be melodic. If they're played at the same time, the interval is said to be harmonic. Remember, intervals are always counted from the lower pitched note to the higher, and that holds true in the case of melodic intervals even where the first note played is higher in pitch than the second. For example, the song, Hey Jude begins with the note C falling to A. 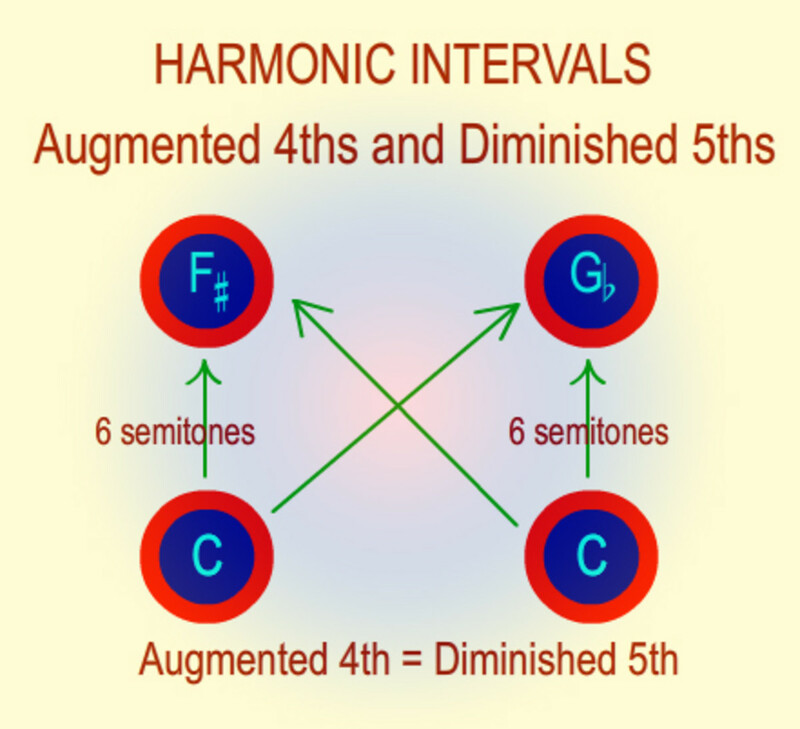 That melodic interval is a minor 3rd because we count the interval upwards in pitch - from A to C.
Harmonic intervals have a special quality which is caused by the interaction of both notes. When we hear a harmonic interval, we can hear three things: the lower note, the upper note, and the harmonic effect caused by the two notes in combination. When the resulting effect of any two notes played at the same time is felt to be smooth and blending, the interval is said to be consonant. When they jar or clash, the interval is said to be dissonant. Although these are partly subjective effects, there is general agreement about which intervals are consonant and which are dissonant as follows. All perfect intervals are consonant. In fact, they're highly consonant to the extent that they can sound bland. A unison has no harmonic effect at all, and an octave is very hollow and uninteresting. Perfect 5ths and 4ths also have a hollow purity which was considered well suited for Gregorian chant in medieval times. The sound of of these intervals in that type of setting, especially with the acoustics of a cathedral, is atmospheric and striking. 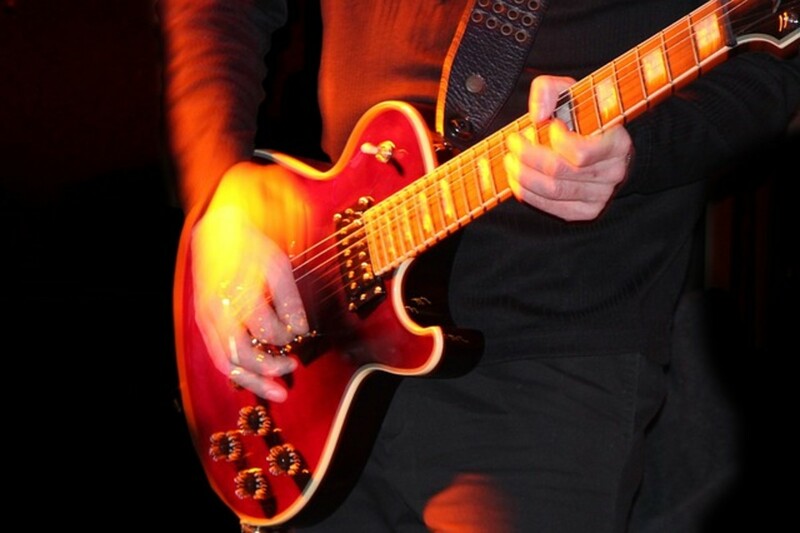 Their purity of sound is the reason that they're used as power chords in rock guitar playing too. Effects such as heavy overdrive or distortion can make normal chords sound very muddy, unstable and harsh, but the simplicity and purity of perfect 5ths and 4ths keep power chords clear, balanced and powerful. All major and minor 3rds and 6ths are consonant. They don't have the purity of perfect consonances but have edge and are more interesting. These types are called 'imperfect consonances'. Major and minor 2nds, and 7ths are dissonant as are all augmented and diminished intervals. They have a more or less jarring sound that introduces tension into the music. Tension, of course, is very important in music. It's the controlled build up and release of tension that causes music to appeal to our emotions in the way that it does. A build up of tension caused by a dissonant interval can be released by following it with (resolving to) an appropriate consonant interval. Without consonance, music would be very chaotic and jarring. Without dissonance, music would be very boring. Some intervals need a context for us to hear their dissonant effect. For example a diminished 7th, such as A to Gb (which is classed as dissonant) is exactly the same as the major 6th, A to F# (which is classed as consonant). If we hear this interval without any context, i.e., in isolation, we'll hear it as a consonant major 6th interval. We can only hear it as a dissonant diminished 7th interval in the right context (such as part of a diminished 7th chord). The perfect 4th is also a special case. In isolation and in certain contexts, it's a highly consonant interval. In other contexts, it sounds dissonant. If we reverse the order of notes in an interval, it becomes inverted. For example, A up to C is a minor 3rd. Inverting it gives us C up to A, which is a major 6th. Major intervals become minor when inverted. Minor intervals become major when inverted. Augmented intervals become diminished when inverted. 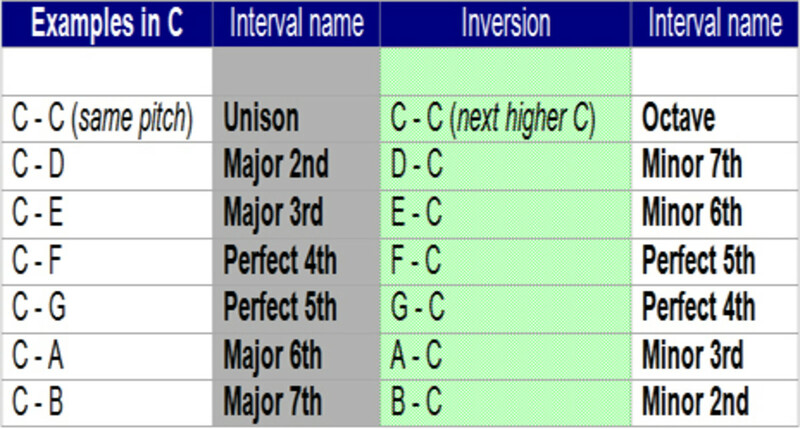 Diminished intervals become augmented when inverted. Perfect intervals remain perfect when inverted. 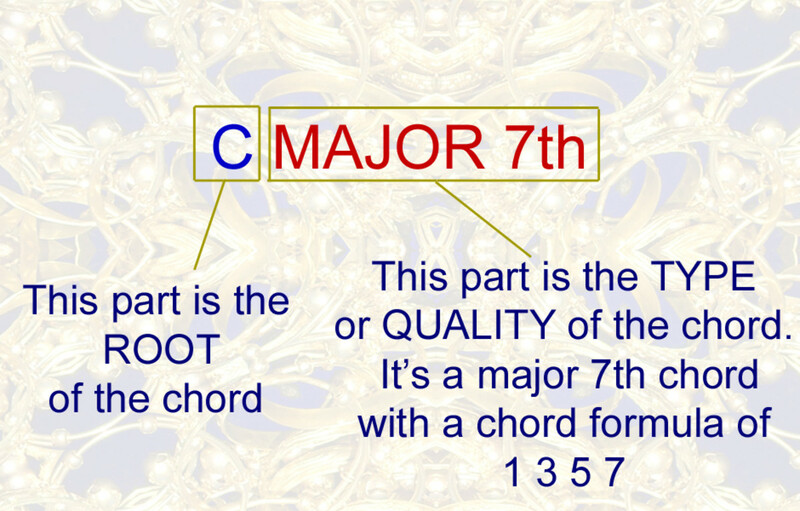 The inversion of a major 7th is a minor 2nd (9 - 7 = 2 and major becomes minor). The inversion of an augmented 4th is a diminished 5th (9 - 4 = 5 and augmented becomes diminished). The inversion of a perfect 5th is a perfect 4th (9 - 5 = 4 and perfect remains perfect). I hope this article gives you an insight into how musical intervals are formed, named and used. To gain an even deeper understanding of them, you should practise singing them, which will teach you how each melodic interval sounds. Some people learn them by associating the first two notes of a well-known song with each interval. For example, the first two notes of "Over the rainbow" make the interval of an octave. A major 6th interval is the interval between the first two notes of "My Bonnie lies over the ocean". You can use any songs you like. Test your ability to recognise intervals of the major scale by ear with this simple ten question quiz in the following lesson. There are also tips for learning how to practise recognising them.